Ruth Ellen Gruber is an American journalist, author, editor and researcher. She has published and lectured widely and has won several awards for her work on Jewish heritage and contemporary Jewish issues in Europe. 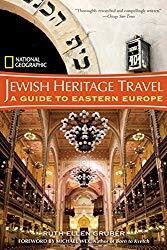 Her book, Jewish Heritage Travel: A Guide to Eastern Europe, was first published twenty-five years ago and is still considered the most complete Jewish travel guide to the region. 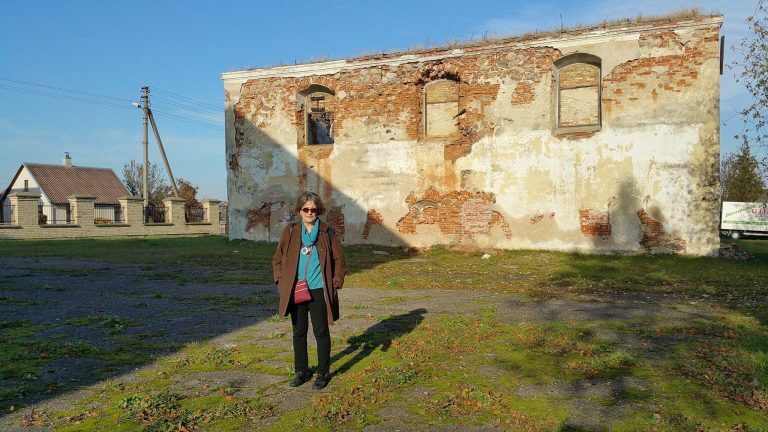 We first learned about Ruth and a bit about her work last year in an episode of Ukrainian Jewish Heritage dealing with dark tourism, which involves travel to places historically associated with death and tragedy. Ruth’s work however sheds light on Jewish heritage sites with the goal of keeping alive the memory of Jewish life in Europe through the restoration of physical reminders. Despite an insanely busy schedule, she has graciously agreed to speak with us about her work, the changes she has observed, and what it means for the future. Pawlina: So you’re American-born, raised and educated. What prompted you to move to Europe after graduating? Ruth Ellen Gruber: In my senior year of college I studied in Europe and then went back, and after graduation I came back to visit my parents who were living in Europe at the time. And then I ended up getting a job (after hanging out at home for a bit). And then doing some research work for my father I ended up getting a job with the Associated Press as an intern in Rome, and then I was hired on a full-time basis by United Press International where I subsequently was based in six different countries in a career with them as a foreign correspondent. Pawlina: So you took journalism in university— that was your degree? Ruth: No, I have a degree in Art. You know, I always wanted to be a writer. Pawlina: Oh! Okay. So you were a foreign correspondent for several years? Ruth: For over a decade, yes. Pawlina: Was that dangerous work? Ruth: Dangerous? I wouldn’t say. When I was a correspondent for United Press International, I worked for them—I was based for them—in six different countries. Half of the time I was in communist countries. And when I was based in Poland, in the very early 1980s, I ended up being arrested and put into jail for 24 hours. And you know there was a big case where they appeared to accuse me of espionage. It was a big nothing-burger, really. They were making a case out of me to try to intimidate other reporters in that I was expelled from the country. But I was never in any danger then. Where I was and what I was doing, I don’t think I was ever really in any danger. As a foreign correspondent I was in Europe the whole time. Pawlina: That sounds scary! Although it’s good that you weren’t in any serious danger… that it was kind of a show thing. Ruth: Yes, it was. But it was a big deal at the time. It was January 1983 and it was a time of great tension. You know, Poland had the Solidarity movement, Solidarnosc. And then martial law had been imposed. And this was an attempt by the authorities to make an example of me. They sort of pretended to accuse me of espionage. Even though it was completely made up—it was very clear that it was made up—but it was a way that they were trying to intimidate other western journalists but also intimidate Polish people who were our sources, who were our friends. Ruth: It didn’t work, but I was expelled from the country and I couldn’t go back to Poland until the ouster of the communists some years later. 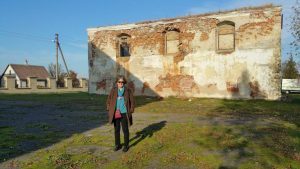 Pawlina: So what led you to specialize in Jewish heritage travel…writing a book? Ruth: Well, half of my career with UPI was in communist countries. Yugoslavia; I was based in what was then Yugoslavia. And then in Poland. And from both Belgrade and Warsaw, I covered the Eastern Bloc, as we called it. This is a place where, especially in Poland, which was, you know, the Jewish heartland. Ruth: But when I covered this area as a journalist, I covered Jewish stories, but only as part of the whole story that I was covering—political, social, economic, whatever. And on my second visit to Romania, I travelled all around Romania with the then Chief Rabbi, who was quite a character. We visited at Chanukah, we visited lots of Jewish congregations and synagogues, Jewish communities all around the country. I think I travelled with the rabbi for six days and I think we visited 19 Jewish communities. Ruth: And so I saw these buildings, and I saw some of the cemeteries. And one these towns was the town that my grandparents had come from. So while we were there I was able to go to the Jewish cemetery and they helped me find the grave of my great-grandmother who is buried there. And I wrote about this. But I wrote about it as part of all the political and other stories that I was writing about these countries. Ruth: However I had had this experience. And then, about a decade later, at the end of the 1980s when the wall was coming down, my brother had just become the founding director of what was called the Jewish Heritage Council of the World Monuments Fund. And he was trying to establish inventories of what remained of Jewish heritage sites in the former Communist Bloc. And since I was covering the revolutions, say in 1989-1990. He said to me: “When you’re out there covering these political events, if you come across a synagogue, Jewish cemetery, whatever, please take a picture, make a description and send it back.” Because there were no inventories of what was there. There was an assumption that nothing remained; there was assumption— let’s say, in the United States—that nothing remained. Or very little remained. ynagogue transformed into something else, or cemeteries that were totally overgrown. This was like visiting sites of tragedy. Ruth: But then, I got very interested in it and I made a book proposal and got a contract to write a guide book to Jewish—to central and eastern Europe. And that became Jewish Heritage Travel, which was my first book. Pawlina: Right, and that was published over 25 years ago now, and it’s been republished in several updated editions. Ruth: Yes, it was first published in 1992, and then there were three more editions. The last one was published by National Geographic in 2007. Pawlina: And you’ve published another book since? Ruth: Yes, I’ve published several other books. 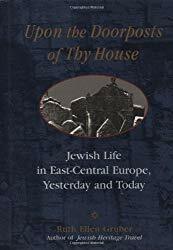 The next book I published was called Upon the Doorposts of Thy House: Jewish Life in East Central Europe Yesterday and Today. And in this book I did five long essays in how the physical remains, the physical traces, of pre-war Jewish history and Jewish civilization resonate today—how they are today, what they look like today. “Today” meaning the early 1990s. Ruth: And how they trigger memory. And I call it “Upon the Doorposts of Thy House” because in Jewish tradition you put a mezuzah—that is a scroll with verses from the Bible, from the Torah, on the doorposts of your house. And they mark Jewish houses; the mezuzah marks Jewish houses. And my conceit that I used in this book was that in many places in Europe (especially in Eastern Europe, but also I’d seen it in Italy) in many houses at that time you could see the scars where mezuzahs used to be; where they had been removed, either by force, or when people moved away, or something. But these scars, these places where mezuzahs used to be (you could still see where they used to be), they denoted places where Jews once lived but didn’t live any more. And just like these empty places of mezuzahs on doors, I made the conceit [that they were] more like these physical remains. The synagogues that still stand, the Jewish cemeteries that still stand even though they may be abandoned and in terrible condition, they’re like symbolic mezuzahs. Because they indicate towns and cities and villages—entire countries—where Jews once lived and don’t live anymore. And then the memories that people have are also like symbolic mezuzahs because they also still resonate, even though many decades have passed. Pawlina: I learned about mezuzahs just last week. I spoke with a young man in Kyiv who I call a “born-again Jew.” His mother is Jewish, and his father is Ukrainian, and he only realized found out seven or so years ago that he was Jewish because his mother was. And so he’s now on a journey of discovery. Pawlina: And he’s also cataloging all the shtetls that have disappeared or are about to disappear in central and eastern Ukraine where there is not that much restoration work being done. And I don’t understand why they would be removed from doors. Ruth: Well, because when the Nazis came the ripped them away. Pawlina: Yes okay, of course. Ruth: Or when people fled they often took them with them. Or when after the war people rebuilt the houses and moved in, they took them down. There weren’t Jews living there anymore. So they took them down. Those were the three main reasons that they wouldn’t be there anymore. Pawlina: I’ve been speaking with Ruth Ellen Gruber, an American journalist, writer, editor and researcher. 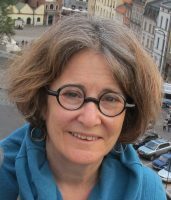 She is the author of Jewish Heritage Travel: A Guide to Eastern Europe; Upon The Doorposts of Thy House: Jewish Life in East-Central Europe, Yesterday and Today; and other books. In part 2 of this interview next week, we discuss other books, a website she runs that collates information and news about Jewish heritage sites in Europe, as well as her work in Ukraine. I hope you’ll join us. Thank you for listening today.